Doug Murphy, 43, wanted to remember his time at Craig Hospital. He and his wife Shannon went to an Englewood tattoo parlor and got matching Broken Man tattoos. The Broken Man is a Craig Hospital internal symbol that dates back to the 1960’s. It depicts a person injured and then made whole again. “Everything happens for a reason. I was sent to Craig for a reason. And that reason was that nobody else could have done what they did,” said Doug. Doug never thought he would need Craig Hospital. After complications from a surgery for spinal stenosis, Doug was paralyzed. When he came to Craig he couldn’t move his arms or legs, and had to breath on a ventilator. “When you’re at your lowest point you don’t think anything is possible. All you think about is the negativity, what I can’t do. The staff does a really good job of redefining that and showing you what’s possible,” said Doug. 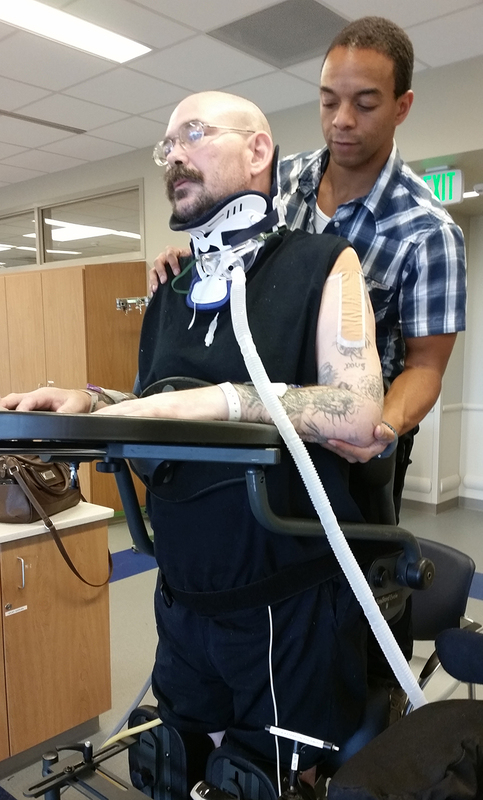 During rehabilitation Doug built a special bond with his physical therapist, Wes Thornton. The unique relationship between clinician and patient is something that has always set Craig Hospital apart from other hospitals. “When I had a great day, He smiled and laughed along with me. If I had an emotional day, guess what? I got the guy to cry with me too,” said Doug. “He’s that patient that you’ll always remember,” Wes Thornton says of Doug. Wes said he became emotionally invested in Doug’s progress, because he knew it would help him. “I’ve really found that I can’t be successful until I can meet my patients where they are. I’m not talking about physically, I’m talking about emotionally,” said Wes. For Doug, the strength from his team is what he needed to push through the tough times. “They made everything possible. They redefined my life. That speaks volumes. You don’t get that anywhere else I don’t think. Where the staff are so emotionally involved in your life. They literally do, they become part of your family,” said Doug. When he left Craig, Doug was able to stand, walk, and do something he loved again: drive remote control cars. That’s why getting the Broken Man tattoo was so important to him.